After graduating from Warsaw Central School, I studied Electrical Engineering at Union College in Schenectady, New York. (The same college that our Chemistry teacher, John Hubbard attended - remember the lab explosion?) Upon graduation in 1965, I was hired to be the first full-time director of their (very small) computer center, and teach computing. In 1969 I went to Brazil as a visiting professor for a half year. When I returned, I was convinced that I wanted to work in computer centers, not be a professor, and in late 1969 moved to the University of Virginia as the assistant director of academic computing. About the same time I moved to Charlottesville, Jenny Ott moved there from Minnesota, in a position in medical research. We were introduced by a mutual friend, and less than a year later (November 1970) were married. In 1975 we adopted our only son Mark, who lives in Frisco, near Dallas. He worked in computer software for the telecommunications industry until he was laid off, along with many others, early in 2002. He survived on temporary jobs, until he landed in a Data Base Administration position for the financial arm of Palm Harbor Homes. After eight years running the University of Virginia Computer Center, I was bored, so in 1978 joined SCT, a consulting firm, that sent me to Philadelphia to run the Temple University computer center for a couple years, then to San Antonio, Texas to run Trinco, Inc., a computer service bureau. As Mark was growing up, I didn't want to move again or be "on the road" full time, so in 1982 went to work for USAA, a large insurance and financial service company in San Antonio, to start their computing advanced technology group. We developed new technology, and one became an IBM product, so I got many invitations to speak at neat places... I've given talks to about 15,000 people in 14 countries. I also got involved in the standards for electronic imaging, microfilm, and workflow management. In 1995 The Continuum Company, based in Austin, Texas, and now part of Computer Sciences Corporation (CSC - 90,000 of my closest friends) convinced me to return to consulting as their principal consultant in Document Imaging and Work Management. That included a move from San Antonio to Austin, Texas. Over the years I have been involved in woodworking, from winning a hobby-show prize in grade school for a wooden stool, to remodeling many of the houses we have owned over the years. A few years ago I started building furniture, in addition to bookcases and cabinets. The demand has gone beyond friends and family - I sold 8 pieces in 2003 and many in 2004. 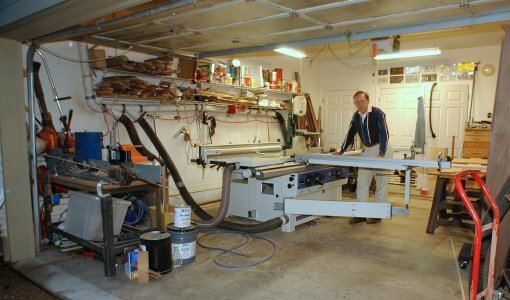 In January 2005 I "retired" - really just switched from full time consulting and part time woodworking, to building custom furniture full time, with part time consulting. I have had a continuous backlog of work, and am "profitable" but still am slow enough that I would have a hard time supporting a family if this were our only income. See the woodworking pictures on this web site.